Presidential secretary Song In-bae has been summoned for questioning in a probe of an online opinion rigging scandal involving the blogger "druking." Song appeared at the office of the independent counsel team in southern Seoul at 9:20 a.m. Sunday. The presidential secretary is known to have introduced the blogger to South Gyeongsang Province Governor Kim Kyoung-soo in June 2016 when Kim was a ruling Democratic Party lawmaker. Song reportedly claimed during the top office's internal probe that he met the blogger four times between June 2016 and February last year and received two million won from the blogger. The special prosecutors plan to summon the blogger as well on Sunday afternoon, but they have no plan to question him along with Song in the same room. 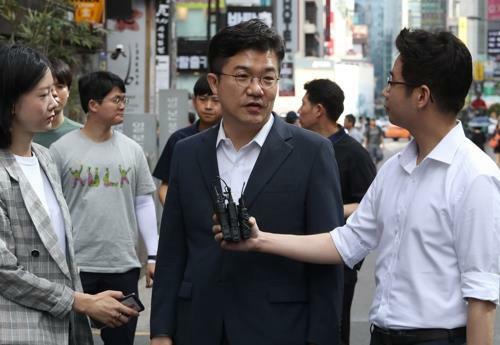 Meanwhile, the prosecution plans to summon and question soon another presidential official, Baek Won-woo, on allegations that he met a lawyer in March, who was recommended to the top office by druking to a consular post.